To view the full Wiki click here or the image above. 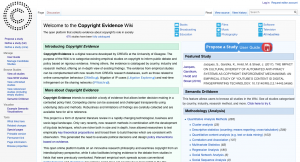 This is part of a series of summary posts rounding-up new entries to the Copyright Evidence Wiki (organised thematically). As part of CREATe’s workstream for the AHRC Creative Industries Policy and Evidence Centre, the Wiki catalogues empirical studies on copyright. This month, we summarise new studies added to the database under the themes of: Piracy; Copyright in Courts, and; Perceptions of Copyright. This month we backdated the last three years worth of IP Crime Annual Reports (2015-2016) (2016-2017) (2017 – 2018). Over the course of these reports, it appears that levels of infringement have remained steady, with some divergence between industries (music piracy seeming to reduce, whereas audiovisual streaming of e.g. TV series increasing). The reports demonstrate the difficulty in ‘knowing the unknown’, highlighting the increasing use of IPTV/kodi boxes, stream-ripping and questions over the regulation of 3D printing. Domon, Melcarne and Ramello’s (2019) study of ‘Digital piracy in Asian countries’ finds that local ethical standards and social norms matter more than legal frameworks when it comes to likelihood to infringe. In a survey of students across China, Japan, Korea and Vietnam, despite being from countries with similar copyright systems, likelihood to infringe was determined more readily by e.g. feelings of guilt associated with this. A study by Rogers (2013) examines the use of the substantial similarity test in US Federal Circuit Courts, building on earlier work by Lippman (2013). They find that a plaintiff’s chances of success are determined both by the position of the Circuit itself, as well as the similarity test employed. Finding that this promotes inconsistency across courts, they suggest that it’s time to vest one court alone with subject-matter jurisdiction. Not all transformative use is equal according to Liu (2019) following a study of 260 US court cases. Now, transformative use cases make up 90% of all fair use decisions, with a 50.8% success rate. The author cautions against turning transformative use into a blanket term that leads the provision down a ‘slippery slope’ in disguising a wide variety of underlying policy concerns. Fiesler (2018) provides a literature review on copyright norms in fandom communities, reflecting on their own work over the past decade. They find that there are persistent dangers of misunderstandings and misinformation when it comes to copyright, both from the close-knit communities of fandom themselves as well as online platforms. Yet, there is also evidence of some effective community norms and self-policing when it comes to attribution and permission. A study by Heredia-Carroza, Palma and Aguado (2019) suggests that flamenco dancers should be considered joint authors of songs, alongside their composers and performers. Following a survey of experts in the Spanish music scene, they find that flamenco is considered to be an important facet of cultural heritage, and that dancers are essential to the externalisation of this. In short, if they are perceived as essential to the creative process, they should be treated as such. See something missing from the Copyright Evidence Wiki? Propose a new study here.